In order to get you thinking about what is happening under the hood, we’re going to briefly cover some of what is actually happening with the SIP protocol when two sets on the same Asterisk system call each other. Bear in mind that there are actually two calls going on here: one from the originating set to Asterisk, and another from Asterisk to the destination set. SIP is a peer-to-peer protocol, and from the perspective of the protocol there are two calls happening. The SIP protocol is not aware that Asterisk is bridging the calls; each set understands its connection to Asterisk, with no real knowledge of the set on the other side. It is for this reason that Asterisk is often referred to as a B2BUA (Back to Back User Agent). This is also why it is so easy to bridge different protocols together using Asterisk. 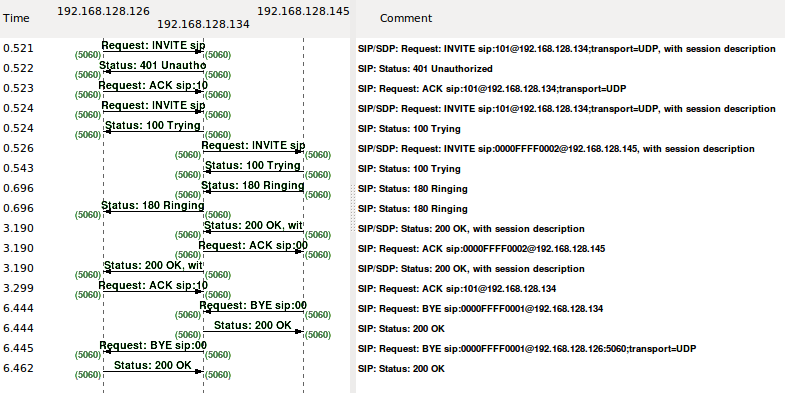 For the call you just made, the dialogs shown in Figure 5.2, “SIP dialogs” will have taken place. For more details on how SIP messaging works, please refer to Appendix B, Protocols for VoIP and the SIP RFC at http://www.ietf.org/rfc/rfc3261.txt.